The first all-female team to use muscle power alone to ski coast-to-coast across Antarctica have been inspiring audiences in Mid and East Antrim. The Ice Maidens, a team of women from the British Army, endured three months on the ice, travelling 1700km pulling sledges and battling temperatures of -50°C and wind speeds of over 60mph. The team’s Major Sandy Hennis and Lance Sergeant Sophie Montague, alongside other local inspirational women have been telling their tale at a special celebration event at The Braid to mark the Seven Ages of Women. 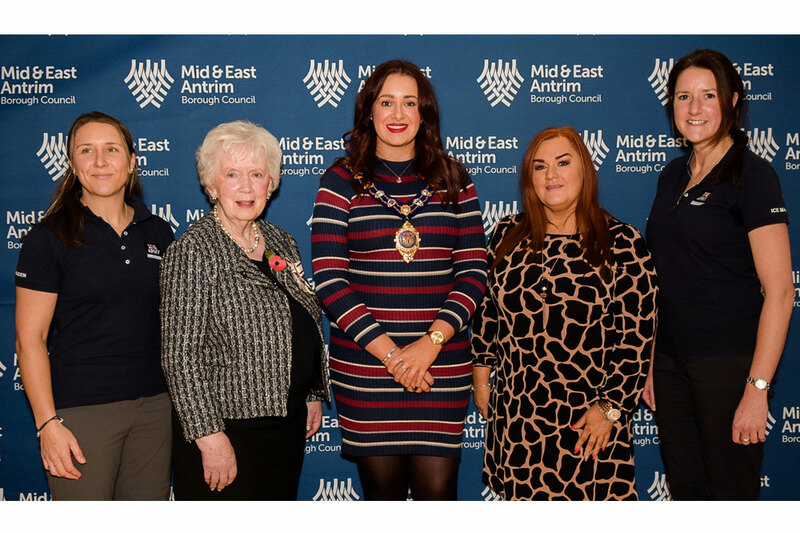 The event was hosted by The Mayor of Mid and East Antrim Cllr Lindsay Millar and Mrs Joan Christie CVO OBE, Her Majesty’s Lord-Lieutenant for the County of Antrim. The audience heard the stories of seven inspirational local women from various backgrounds speaking about how their life experiences have shaped them. A beautiful musical performance of Coldplay’s song Yellow by local artist Erin Fullerton kicked off the morning, hosted by UTV’s Judith Hill. Speakers included Council’s Chief Executive Anne Donaghy, who shared her inspiring story of becoming a mother to Andrea who has Downs syndrome, working her way up the chain to become a leader of one of Northern Ireland’s top performing councils and what it takes to get there. 11-year-old Madison Wright from Carrickfergus who has dedicated much of her time to fundraising for the NI Hospice wowed crowds with her fantastic speaking skills (and fashion sense) as well as her inspirational story of how she gives up so much of her spare time to help others. A true leader of the future and one to watch! Army Cadet Sergeant Megan McGaughey also told her story of what it was like to take part in the Lord Dannatt Round Britain Challenge on board the Lord Nelson Tall Ship alongside other cadets and injured soldiers. Young Artist of the Year finalist, Lucy Craig, spoke all about the moving project she used as part of her degree featuring love letters between her grandparents. She has also featured in a UK wide textiles project commemorating 100 years of women having the vote. Northern Ireland Captain, Julie Nelson, talked about what it is like to be a dedicated sportswoman. Julie recently received her 100th cap for her country and is the IFA’s ambassador for women’s football. Rhonda Houston, otherwise known as Granny Shaw’s Fudge Factory, was greeted with a standing ovation after sharing her story about surviving cancer and going on to set up one of Northern Ireland’s leading confectionary businesses. 80-year-old Paddy Weatherhead shared her inspiring story of how her career as a nurse and the loss of her husband changed her life to help others. She has worked with Cruse Bereavement and now Mid and East Antrim Agewell Partnership, and has helped hundreds of others through their grief journeys. The Ice Maidens showed videos of their amazing achievement and shared the challenges along the way. Including what songs they sang to keep them going, with a certain “Let it Go” attitude taking hold to get them to their record-breaking victory. 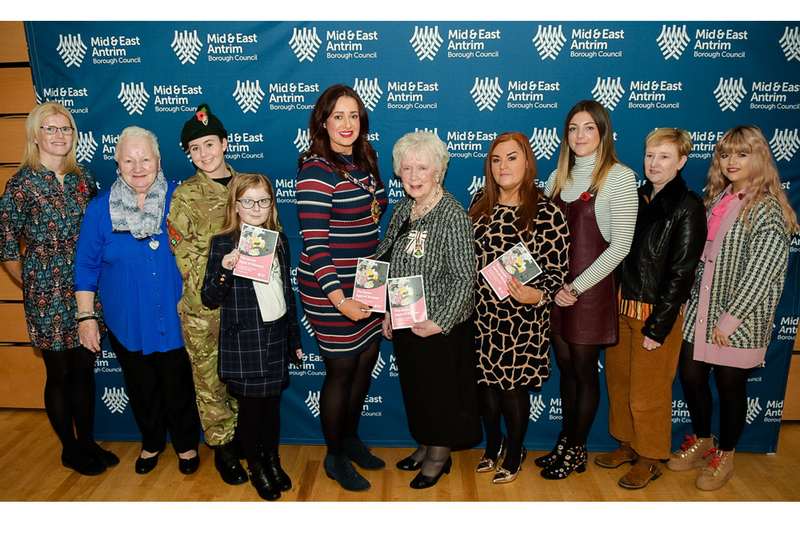 Mayor of Mid and East Antrim Cllr Lindsay Millar said: “I am so proud to hear all of these strong, inspiring women share their stories in such an open and honest way. Truly remarkable achievements have happened to these women here today and I hope that women in the audience will feel encouraged and supported to go on to achieve amazing things in their lives. “As Mayor it was my aim to open the role and the office of Mayor to all and especially women, young and old. Events like this are an amazing way to remind ourselves as women we can and are achieving great things, so don’t forget or let anyone make you think otherwise. A huge thanks to the Ice Maidens Team for taking the time to visit us here in Mid and East Antrim, and to all those brave women who spoke today. I would also like to thank Mrs Christie for helping us create such an unforgettable event.